The engine has been borrowed from the Discover 110. Hat tip to automotive enthusiast and Youtuber INDIAN BIKE for sharing this exclusive video. Bajaj Platina 110 CBS, a new variant of the company’s popular low-cost commuter nameplate, has been launched at Rs 49,300 (ex-showroom, Delhi). Though Bajaj Auto’s official website is yet to list the new model, it has already started reaching dealerships in certain parts of the country. The existing Platina which is powered by a 102 cc air-cooled DTS-i engine is likely to be retailed alongside till the stocks last. For a premium of less than Rs 2,000, the new model adds enough features to render the older one obsolete. The most significant update, of course, is the 115.5 cc air-cooled DTS-i engine which has been borrowed from the Discover 110. Mated to a 4-speed gearbox, the engine is good for 8.6 PS and 9.81 Nm of torque. That’s 0.7 PS and 1.46 Nm more than the existing model. The improvement in real world performance should be noticeable. 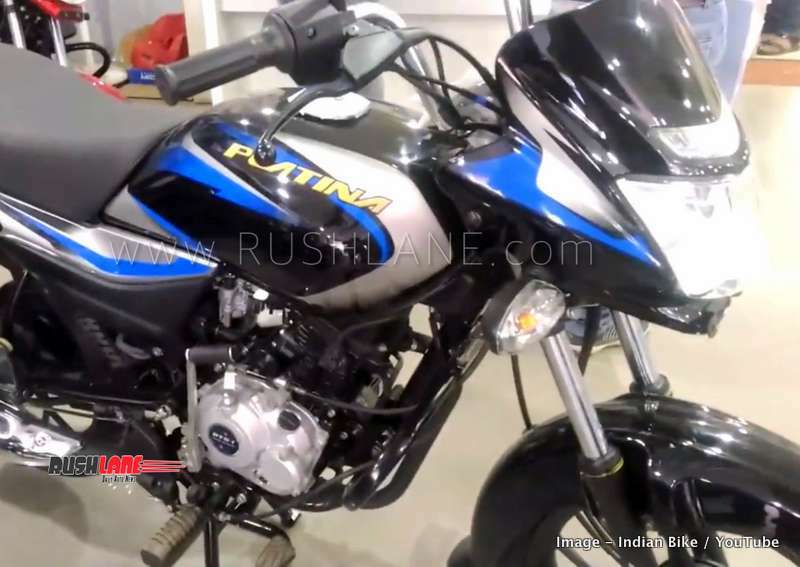 In addition to the engine, the new Bajaj Platina 110 is also equipped with the combi-braking system (Anti Skid Braking in Bajaj’s lingo) which will be mandatory as per the new safety regulations that are set to kick in from April 2019. The Platina 110 comes with standard drum brakes at both ends while the front disc is available as an option. Watch the first walkaround video below. In terms of styling, Bajaj hasn’t changed much since the Platina has been updated regularly and the previous style update wasn’t long ago. The fresh appeal is offered by the sportier and bolder decals and new alloy wheels that are borrowed from the Discover family. The twin rear shock absorbers of the low-cost commuter now also gets inverted Nitrox chambers for added comfort. As far as dimensions are concerned, the new Bajaj Platina 110 CBS is 3 mm longer at 2,006 mm, and 7 mm taller at 1,076 mm. The fuel tank capacity has dropped by 0.5 liters to 11 liters. We expect this update to kick start a flurry of similar updates from the competitors in the coming days.